A recent editorial in The Forward demonstrates how much the American rabbinate has changed in the 21st century. The economy has made it difficult for many rabbis to find good jobs; and for them to keep good jobs when the synagogue or organization falls on tough financial times. A reduction in the number of congregations due to closures and mergers has also caused a dearth of desirable positions for rabbis in the U.S. and Canada. But there are other factors involved as well. New rabbinical schools (Yeshivat Chovevei Torah, Ziegler at the American Jewish University, Hebrew College, and the Academy for Jewish Religion) have cropped up in the past fifteen years increasing the number of new rabbis looking for work. The Internet has also made it much easier for the laity to learn synagogue skills -- life-cycle officiation, prayer leading, and teaching -- that may ultimately reduce the need for a rabbi, although I don't believe that to be the case. As the Forward editorial makes clear, "the role of rabbi is being challenged as never before." Some sociologists like Prof. Jonathan Sarna of Brandeis University predicted precisely such a change in the American rabbinate based on shifting demographics and the needs of the community. However, I don't see this as a crisis in American Jewry. Rather, I find this to be an interesting opportunity for rabbis to become more entrepreneurial -- both as a way to be necessary and to make a significant contribution to our people. Rabbis who see this as a chance to reinvent their rabbinate will ultimately be the most successful in the new era of Jewish life. And that holds true not only for American rabbis, but for rabbis throughout the Jewish world who have the entrepreneurial spirit. I'm currently taking part in a Jewish Federations of North America (JFNA) Rabbinic Cabinet Mission to Ukraine and Israel, and writing this blog post on a plane headed from Kiev to Tel Aviv along with a few dozen of my colleagues from the multitude of denominations. One thing I've noticed on this mission is that when rabbis meet each other for the first time, in general, they no longer ask each other "Which congregation do you lead?" Rather, the question is something along the lines of, "Where are you from and what do you do?" Rabbis today are exploring much different rabbinic paths of leadership than in previous generations. Growing up I always thought the role of the rabbi was solely in a synagogue. All of the rabbinic role models I had as a child were pulpit rabbis. Today, much has changed and the majority of rabbis do not work in congregations. Talented rabbis are working in day schools, Jewish Community Centers, camping agencies, communal organizations, college campus institutions, and philanthropic foundations. They are also cobbling together two and three part-time jobs in ways never imagined in previous generations. Several entrepreneurial rabbis are taking a page out of the Chabad emissary playbook and founding new congregations and small prayer communities where there is a need. While not an easy task, these rabbis are finding the "start-up" experience to be exhilarating, significant and spiritually fulfilling. Rabbis are also freelancing their skills more often. As the number of Jewish families and singles unaffiliated with a congregation rises, there is an increased need for rabbis to perform life-cycle leadership roles. With the growth of the internet it has become easy for people to identify rabbis to officiate at a baby naming ceremony, wedding, funeral or unveiling. A recent article in The Jewish Week showed a new trend for private bar and bat mitzvah ceremonies, independent of synagogues, that is prevalent on the East Coast. And that trend is spreading to the rest of the country. As a rabbi who is not affiliated with a congregation, I am called upon often to lead life-cycle ceremonies and I know that is the case with my colleagues around the country who likewise aren't working in a congregation. Our culture of desiring the best products has reached into the religious leadership marketplace as well. A Jewish couple no longer feels compelled to have the rabbi of their childhood congregations preside at their wedding ceremony. Instead they will select the rabbi who they believe will create the most meaningful, memorable experience. So too with other life-cycle events like funerals. 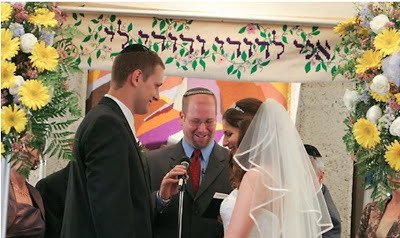 I'm often asked to perform the weddings of young people with whom I developed a relationship working as a rabbi on a campus Hillel or at a Jewish summer camp. Many of these young people have moved away from their childhood communities and don't have a meaningful relationship with the rabbi of their parents' congregation, but like everything else in life they are seeking the personable, meaningful, and memorable. I believe that while laypeople may be able to perform many of the functions traditionally reserved for rabbis, there is no replacement for the vast array of skills a rabbi brings after years of training. A one-year online rabbinic program may be a worthwhile endeavor for many spiritually seeking Jewish people who are not able to attend a five- or six-year rabbinic training program, but they will not be a legitimate substitute for a rabbi. As the Forward editorial articulated, "For many American Jews, there is no substitute for the penetrating power of a brilliant sermon, or the comfort offered by a rabbi who knew the dying person before she became ill. There is no one else to mold and lead a religious community, to carry on and interpret our great tradition of scholarship, or to stand as a moral lighthouse in this foggy time. No one else to represent ourselves to ourselves, and ourselves to other people. Which is why defining and sustaining the role of the modern rabbi is one of the most vital challenges before the American Jewish community today." I don't believe the rabbinate is in crisis, but I do believe that the most resourceful and entrepreneurial rabbis will be the ones to emerge successful in the Jewish world. Professional programs like Clal's Rabbis Without Borders fellowship have realized this and are helping guide rabbis in the new rabbinate. The rabbis who embrace rather than dismiss the new realities of Jewish life will be the ones to make positive contributions to their community in particular and to global Jewry in general. And those rabbis who don't dwell on the past ("the good ole days of the rabbinate"), but seek out modern innovations to guide their leadership and influence will be the most dynamic Jewish leaders of the future. We can't underestimate the importance of a personal connection. Congregational rabbis often become so overly occupied with the many aspects involved in daily life and routine, that they don't always have the time for strong interpersonal connections. Members may feel like they are bothering them with a simple question to taking too much of their time for more important matters. Others become aloof, and less approachable, not RAB, of course. I have learned so much from you, from your postings on FB and from your blog. In just a few moments of my time, I know you quite well, as I'm sure, just from my comments, you know me, too. I love that I feel free to pitch you a quick question and get a nice response. I always enjoy your thoughts and reading what you have to say! Shabbat Shalom! The insightful Rabbi Jason Miller writes: “I don't believe the rabbinate is in crisis, but I do believe that the most resourceful and entrepreneurial rabbis will be the ones to emerge successful in the Jewish world”. Right on Rabbi! A Rabbi like any successful leader must be entrepreneurial “organizing, operating and assuming the risk of a venture”.